300, 400, 450, 600, 650, 750, 800, 900, 1000, 1200, 1400, 1500, 1600, 1800 and 2000. The belt in width not listed can be manufactured as per the customer's requirement. Belt edges can be given in both cut edge and sealed edges. A. Synthetic Carcass: The carcass consists of Nylon-nylon (NN) and Polyester Nylon (EP) constructions and are available with ratings starting from 200/2-315/3 up to 2000/6. 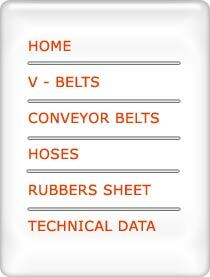 For further information on complete range and grades, refer to the technical belt selection chart. B. Cotton-Cotton Carcass: The Cotton Carcass belts offered are available in 28, 32, 34, 36, 42 & 48 Oz from 2 to 10-ply construction. C. Cotton / Nylon Carcass: The range of cotton / nylon Carcass belts are available as per customer's specifications. 7. Suitable for all types of Cover Grades. 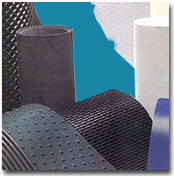 Specially compounded rubber cover grade recommended for maximum resistance against abrasion, tear, cuts & strong impacts. This cover grade is recommended for heavy-duty applications for abrasive materials such as large lump ores, sharp rocks, granite, iron and copper. Specially compounded rubber cover recommended for superior resistance to cutting & gouging. Conforms to maximum abrasion loss value specified for grade M in DIN 22102. Belts made with this cover grade conform to IS 1891 Pt. I. Specially compounded rubber cover grade recommended for handling moderately abrasive material. Conforms to the maximum abrasion loss value specified for Grade N in DIN 22102. Belt made with this cover grade conform to IS 1891 Pt. I. Specially compounded rubber cover grade recommended for handling materials like alumina, ash, chemicals etc. having material temperature over 65 °C and up to 125 °C for coarse and 110 °C for fine materials. The Belts made with this cover grade conform to IS 1891 Pt. II for HR-Type T-1 grade. Specially compounded rubber cover grade to provide adequate heat resistance for handling material temperatures over 65 °C for coarse & 125 °C for fine materials. The belts made with this cover grade conform to IS 1891 Pt II for HR Type T-2 Grade. Specially compounded rubber cover grade provides excellent heat resistance & moderate abrasion wear resistance characteristic & is recommended for material temperature up to 200 °C for fine materials. Specially compounded rubber cover grade recommended for handling chemically active material with or without oil coating, like ANP, Suphla, Potash etc. Specially compounded rubber cover grade with blended synthetic rubber compounds recommended for giving resistance to mineral, vegetable & animal oils. V-Con Belts made with this cover grade conform to IS 1891 Pt. III. Specially compounded rubber cover grade recommended for use in Tea Gardens, Food Processing Industries etc. This cover grade conforms to IS Pt. IV. Light duty conveyor belts are manufactured for all most all applications in all V-Contries with various fabrics impregnation like polyester, nylon, cotton, solid woven, fibre glass etc. Belts are available in different colors like green, white, black, blue, petrolgreen and thickness from 0.5 mm to 7 mm upto 2400 mm width & with top surface coating Rubber, PVC, PU & Silicon. Low operating noise & costs, reduced maintainence, excellent durability. Light & thin, better strength / weight ratio - energy saving. Superb tracking over great length - longitudinally flexible & laterally stiff. Antistatic - prevents eletrostatic build-ups can be fitted with flights, profiles & sidewalls. Simple thermo jointing finger or spliced and can be done at site even. Packaging, Pharmaceuticals, automotive V-Contry, sorting & baggage handling, baking, biscuit & tiles making, caning treadmills, fruit & vegetable handling fish processing, glass & insulation. This belt, provided with cushiony and anti-slippery effects due to its soft rugged surface for transporting fragile or deformable materials and packed goods. This belt has been highly acclaimed especially when they are used as telescopic or feed belts or weighing and packing belt, it can be driven over narrow pulley diameter (even lower than 100 mm) at the speed of 25 M/sec. Moulded radius on the top surface provides the reel for steady handling. Reel Conveyors are suitable for conveying paper-reel, barrel, etc. Belts with side walls have a very specific function to perform. They are mainly used for zero spillage, fast and bulk material handling. White Hygienic conveyor Belting for odour free, material movement particularly for food processing V-Contries like Tea, Coffee, etc. And pharmaceuticals. These belts are suitable for high inclination and also used for magnet separator. All cotton drytop surface with Hygiene centre are available for use in Bakery / Food process V-Contry etc. 'V-Con' Chevron Belts are available with the various types of profile and it can convey the material on slopes or heights upto 45° . Base Belt plays a key role in steep angle Conveyor Belt. The base belts are made with special cross rigid Member design to get more stability and rigidity. 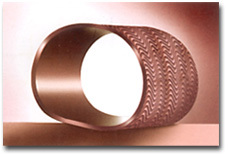 The different design of cross rigid belts are available with us as V-Con 'CTR', V-Con 'CBR', V-Con 'CBR', V-Con 'CDR'. (Please call us to know more details). Steep Angle Conveyor Belts are modern age Bucket Elevator Box Belts. These Belts are made with Cleats and Sidewall. The concept of steep angle belts is to carry materials on steepest angle upto 90° with zero spillage. These belts can be driven at the speed upto 5 M/sec. The space requirement is quite less as compared to Conventional Belts. 'V-Con' Pipe (Tube) Conveyor Belts designed to handle ecologically dangerous materials that cause severe pollution to the envionment and working area. Pipe Conveyor Belts have revolutionised the traditional mode of material handling. The belt in this system flattens itself at the loading and discharge stages after it assumes a pipe shape during its forward / return runs. The idlers are arranged in a hexagonal array with three rolls on either side. "V-Con" cleats are designed with proper rigidity to preclude excess backward bending due to gravitational force exerted by the material loaded in the cleats. By seeing critical application, we have modified our all type of cleats with Synthetic fabric, reinforcement to avoid tearing due to material gravitational force. Type 'T', 'K' and 'TKS' charts are reinforced with metal fastners through side wall.